You don´t need to hit the wall! Almost every upcoming marathon runner has been told a horror story about hitting the wall somewhere after 30k in the race. “You will suddenly lose all power and momentum”, “You will get hypoglycemic”, “You will inevitable slow down”, “The last 5k will be a brutal fight against your weaker self” – Don’t be scared, these things can happen but they won’t happen to you when you follow some basic rules. The marathon distance requires a nutrition strategy! That’s it. Running the 42 kilometer distance without any nutrition intake will compromise your time, because your metabolic system isn’t prepared to run for 2, 3 or 4 hours with what’s stored in your body. The human body stores fast available energy from carbohydrates (CHO) in the form of glycogen in your muscles, that’s about 2400kcal. The faster you run, the more energy you burn per minute (kcal/min), just like a car. That´s why CHO are your body’s first choice in a race. If you run “full gas” your glycogen stores will be depleted after just 90min. 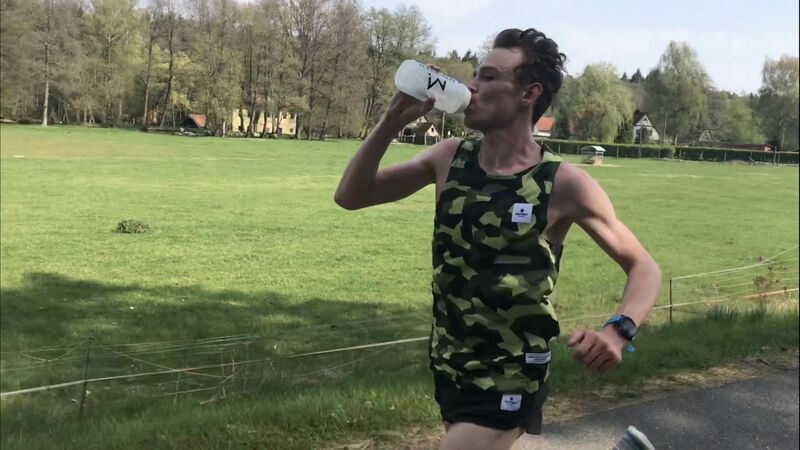 For elite male runners, 90 minutes is roughly when they will reach the 30k mark and, not surprisingly, the big leadpack often starts to fall apart rapidly. The guys who timed their pacing wrong or didn´t fuel properly during the race just run out of fast supplied energy (CHO/glycogen). The body then has to use fat as the main energy source, which supplies energy much more slowly which is why athletes often slow down. Read the headline again – there is no need for that! Yes, your body stores less CHO than is needed during a marathon race but thanks to the modern sports drink industry you can refuel from the beginning and avoid the point of total glycogen depletion. I recommend drinking 150-250ml water + 20-40g/CHO each 5k depended on the ambient temperature and your individual sweat rate. Also, add salt if needed to avoid cramping or carry salt tablets with you. It’s very important to start fueling from 5k on because you have to shift the point of glycogen depletion - you don’t want to wait until you are already depleted. And your stomach isn’t stressed early in the race making it much easier to take on carbohydrate. Therefore you can stick to water or leave a drink after 30k/35k when the racing gets harder and you don’t feel like taking on more fuel. Find out what gels are supplied at your race and try them before, or carry your own gels with you and take them just before the official water stations. Most times you won’t be allowed to place individual drinks like the elite runners but you can bring your family & friends with you and they can give you your individual drink mix each 5k. Maurten has invented a hydrogel technology. The drink instantly converts to hydrogel in the acidity of the stomach, encapsulating the carbohydrate. That enables a smooth transportation of the drink through the stomach to the intestine where the water, salt and carbohydrate are almost absorbed in real time – you will feel the push within 500m. Too good to be true? No, but you have to prepare your own mix as there is no gel version so far. As a result of that stomach-friendly energy solution you can now absorb twice the amount of energy than you could before (60g/h vs. 120g/h CHO). Make sure to try different nutrition options in your preparation, ideally during your long runs. That includes experimenting with gels, other drink mixes, and salt. There is no one perfect nutrition strategy. Find what works best for you and stick with it. You have invested so much time and heart in your goal, don’t mess it up because you didn’t think about your marathon nutrition strategy. When you can avoid total glycogen depletion during training and racing why stick to old school fat metabolism training? With carbohydrates during your long runs you can train faster than running on fat oxidation plus without tiring. And faster, more marathon specific, training normally results in faster racing! That’s why I’m not a fan of “long slow distance” training and my coaching principle is to go for long runs vs. long jogs as I discussed in my first post here. The trend of carbohydrate fueling in training and racing goes hand in hand with recent improvement in racing times and in my opinion confirms this theory.